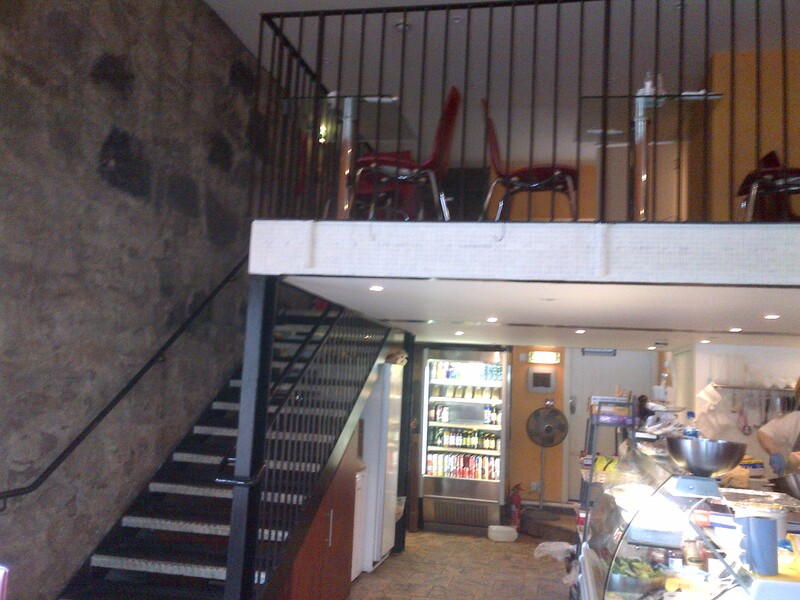 Previously a West End outpost of Locanda de Gusti, under the name Santo’s Bistro, the Exchange Café, on Canning Street, is one of those places, where I’m increasingly finding myself, that suffers from a slightly betwixt and between location, much like Elbow and Bijou Bistro. 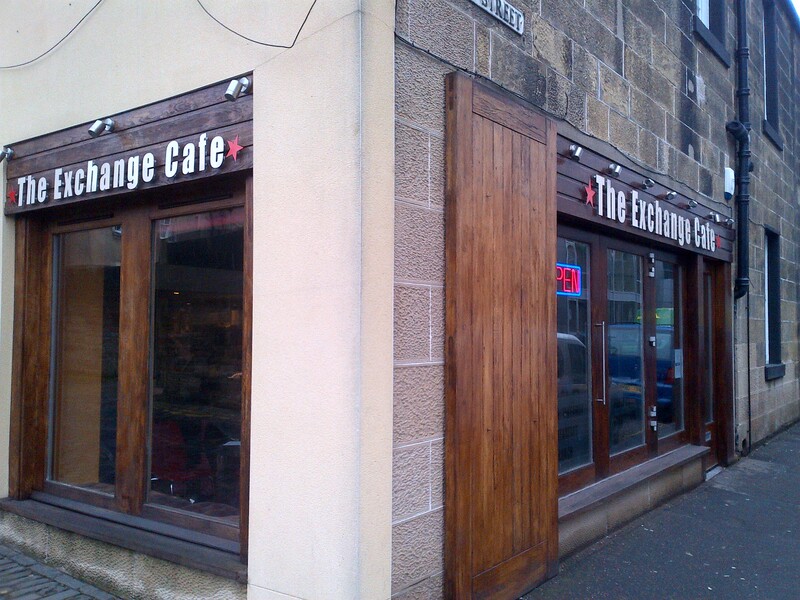 The place is amply served by a good amount of passing office trade, from all the various “Exchange” buildings that lurk in that part of town, so it should have a good opportunity to thrive. The corner shop front gives the impression that the place will be quite small inside, but there’s room for a good number of folks to sit in, across their split level interior. I imagine that they do a good amount of their business as takeout, though. I was favouring that approach, today, as I had my sights set on a breakfast roll to start the day. 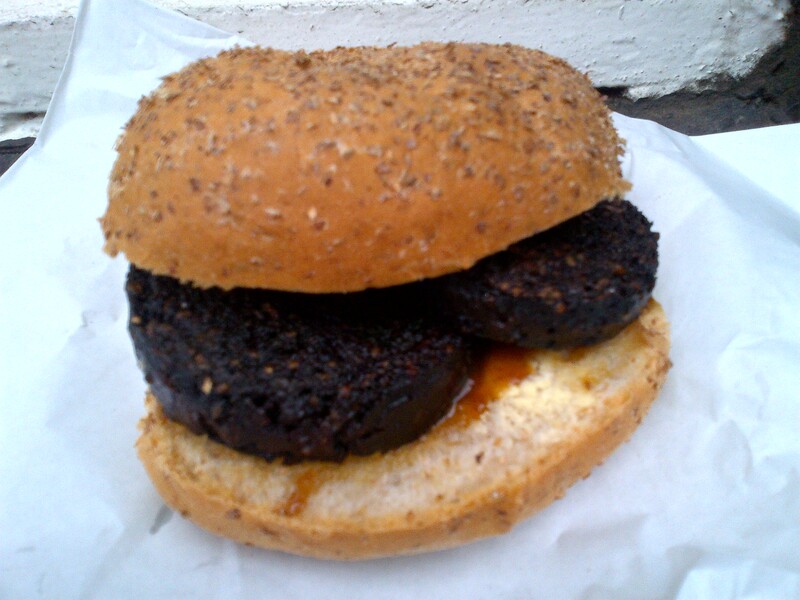 From a wide selection of options (bacon, link sausage, lorne sausage, black pudding, fried or scrambled eggs) I chose black pudding on a brown roll with brown sauce. Cooked up freshly on the grill, then neatly wrapped by the very friendly counter man, I was soon on my way along the road towards the heart of the city. Having paused to take a photo of my item, on an obliging nearby window-sill, I was soon walking and eating. The fresh roll was excellent and the black pudding was extremely tasty. Two generous slices meant that the ratio of roll to filling was just right, with the brown sauce adding the required fruity zing. So, in the current breakfast roll stakes, I think Café Fresco leads for bacon, Herbie leads for lorne sausage, Sandwich Culture leads for link sausage, Nikki’s leads for haggis, and now the Exchange leads for black pudding. 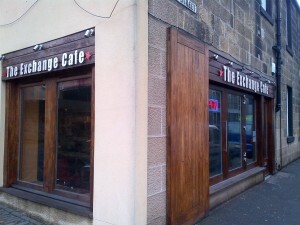 So overall, I was suitably impressed with the Exchange Café. They offer a good range of breakfast rolls, and the rest of the menu looks to keep things simple, with some good sit-in and takeout options. 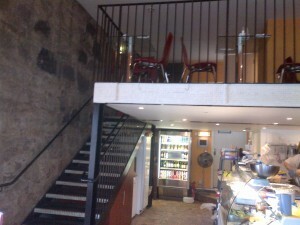 It’s a grand wee spot, tucked away from the main drag between Haymarket and the city centre, but it’s worth seeking out.